With a stay at Bali Rich Seminyak Villas in Seminyak, you'll be in the entertainment district and minutes from Eat Street and close to Kuta Beach. 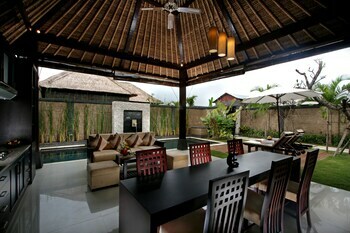 This 4-star villa is within close proximity of Seminyak Square and Petitenget Beach. Make yourself at home in one of the 17 air-conditioned rooms featuring private pools and LCD televisions. Your room comes with a Select Comfort bed. Rooms have private patios. Kitchenettes are outfitted with full-sized refrigerators/freezers. Cable programming and DVD players are provided for your entertainment, while complimentary wireless Internet access keeps you connected. Take in the views from a garden and make use of amenities such as complimentary wireless Internet access and concierge services. Additional features at this villa include babysitting/childcare (surcharge) and barbecue grills. Guests can catch a ride to nearby destinations on the area shuttle (surcharge). Enjoy a meal at a restaurant or in a coffee shop/café. Or stay in and take advantage of the villa's room service (during limited hours). Breakfast is available for a fee. Featured amenities include a business center, express check-in, and complimentary newspapers in the lobby. A shuttle from the airport to the hotel is complimentary (available 24 hours). 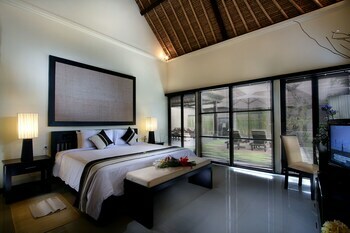 Bali Rich Seminyak Villas is the best Seminyak lodging choice for your trip to Indonesia. With numerous amenities for guests such as 24 hour front desk, concierge, dry cleaning service, you will wake up at Bali Rich Seminyak Villas feeling excited every day for your time in Seminyak. Don’t let this amazing reservation opportunity pass you by, book your stay at Bali Rich Seminyak Villas today to make the most of your time in Seminyak, Indonesia.